Creative and artistic types have skills that can not only lead to a robust salary, but a considerable side hustle. While there are more defined (hence narrow) career paths for STEM graduates, such as engineering, than let’s say for a literature or philosophy major, the career options for creatives are as broad as the earning range — even for those within the same major, says Ryan Nunn, an author of a 2017 report from the Brookings Institute. Not surprisingly, the earning potential amongst liberal arts majors very much boils down to career choice. For instance, psychology majors who become psychologists start out earning about $49,000 a year. However, psychology majors that become counselors start out with a median salary of just $37,000. If a single job doesn’t pay enough to cover your needs, or you simply think like an entrepreneur and want to establish multiple income streams, technology and the internet have provided avenues for creatives and liberal arts majors to pursue various streams of income using digital platforms. You can sell your expertise (e.g. public speaking, life coaching, writing proposals) by creating courses that are marketed and sold through an online learning platform. The work requires considerable labor in the front end: Recording video lectures, creating a class syllabus, writing content and coming up with assignments. However, once the work is done, you simply have to post your course (study the format and marketing of successful online courses for context) and get a percentage of the course sales. Pay models vary between online learning platforms depending on their business models (e.g. monthly subscription versus pay-per-class), but typically you get a percentage of the sales combined with royalties calculated by minutes of your videos watched. Start by researching how to create online courses on one of the many online learning portals, such as Zeqr, Skillshare, Teachable, Yondo, Lynda.com, Uscreen and Udemy. Copy editing can be good work for English, journalism or literature majors — basically people with an affinity for the English language and its rules — and the work can be done remotely as long as you have a computer and Wi-Fi access. First, find out if you’re a good fit for copy editing work. As a copy editor, you’ll review written material and check for factual accuracy, spelling, grammar and readability. This is an extremely detail-oriented job for people who are resourceful enough to look up style and grammar rules they don’t know and who also possess a high standard of accuracy. As a creative person with skills in areas such as communications (branding, marketing, social media), writing, graphic arts, therapy and much more, you can sell your expertise online over online consulting and coaching platforms, which allow you to register your profile as an expert and either allow clients to come to you or for you to bid on jobs. All you need is a computer or smartphone and internet access. Be smart and identify your expertise in an area that addresses a recurring pain point, and think about how you’re going to market your services. Among the places where you can get started is on the consulting and coaching platform Clarity.fm, where experts get paid by the minute to talk to clients over the phone or online, or Zeqr, where you can sell your knowledge one-on-one or through online courses. Other places you can sell your expertise are JustAnswer, where potential clients post questions online and registered experts (e.g. antique appraisers, essay experts and more) bid to answer the question; Ether, where you register and can sell your expertise through either phone, email or your website; and PrestoExperts, which is an online service that connects clients with question to experts with the answers. To make money on the side with writing, you need to start with a foundation of good writing and research skills. You will also likely have to interview sources, so your interview skills need to be on point. There’s all kinds of writing jobs, from copy writing to content writing across industries to branded content writing (which is essentially marketing), and the majority of the jobs can be done remotely. Not surprisingly, demand is directly related to your experience and areas of expertise. Niche expertise, such as within the aviation industry or blockchain applications in security, can impact your marketability. So define some areas where you already have contacts and knowledge, and make sure you have a website that showcases your best work and features your contact information. (If you don’t have samples of published work, then that’s where you need to start.) The average hourly wage for a freelancer writer is $24.70. If you’re just starting out, there are also freelance writing job boards and marketplaces to advertise your services and look for work, although the competition can be tough, writes Entrepreneur contributor John Rampton. Make sure you’re the sort of writer that hands in accurate and cleanly written work and delivers what was asked, so you’re not creating extra work for a busy editor. This will likely move you into the stable of writers whom an editor wants to work with again. Some places to look include the part-time jobs website FlexJobs, which features writing gigs in specific categories, such as gaming, financial or medical writing; Freelanced, a freelancer social network where you can search for jobs and share your portfolio; and FreelanceWritingGigs, which lists freelance writer and editor jobs across a variety of industries. Create and sell stock photos. You don’t have to be a professional photographer to build a side hustle selling stock photography. These days, smartphones have such high quality cameras that you no longer need a fancy camera to create premium photos. Some non-exclusive (meaning you can sell the same photo on multiple sites) stock photo websites where you can sell your photos include Shutterstock, iStock and Adobe Stock. Once you’re approved as a contributor, you can earn approximately 15 percent on your photos. Other stock photos sites, such as Getty (which pays more per photo) will claim exclusive rights to your photos. To get started, here are some tips from Megan Betteridge, a recent college graduate who started selling stock photos as a way to make money: Lighting matters, so if you’re shooting outside, shoot to capture the light in the early morning or evening sunset. Also, try to think about what the stock photo needs may be ahead of big events, seasons and holidays, e.g. Halloween and Christmas. Finally, specific and well-defined tags are important so that your photo emerges in search. So don’t just tag a photo of a baby and a dog as “baby and dog.” Specify what type of dog, what are they doing (e.g. sleeping) and whether the baby a boy or girl. Social media is a highly creative field. It requires both a highly developed visual eye and skill for copy. You also need to be a master of various social media channels as well as the different strengths of each tool (e.g. Facebook versus Instagram versus Snapchat). The responsibilities of social media marketer includes setting up social media accounts, performing a social media audit (examining client’s social media presence), developing a strategy to create, curate and manage all published content across social media accounts as well as developing marketing campaigns. Social media managers grow sustainable social media followings. There isn’t one way to become a social media manager. Most full-time positions look for, at minimum, a bachelor’s degree in communications, journalism or marketing. If you don’t have one, then look for freelance work to build your experience and credentials. You can also seek additional training, for a price: Hootsuite Academy offers certification, and General Assembly offers bootcamps and workshops on social media management. The bottom line for becoming a social media manager is to demonstrate command of social media tools and an understanding of how to build and manage a following through content. While you can do this through job experience, if you’re new, then you have to establish your credibility and create a successful social media following of your own. You can also market and promote your services online, blog for free on other related sites providing free tips and using social media channels, build a following and reach out to businesses or individuals. The median salary for a social media manager in the U.S. is $54,238. If you’re just starting out in this line of work, search for more entry-level social media job titles, such as “social media specialist,” “social media assistant” and “social media associate.” The median salary for social media assistant is $49,395. You can look for remote social media positions on job sites including LinkedIn, Glassdoor, Monster, ZipRecruiter, CareerBuilder, FlexJobs and Indeed. Or if you’re looking for freelance work, try searching on Upwork, Freelancer, Fiverr and PeoplePerHour. Or try job sites for remote workers, such as Remote.co, Remoteok.io, FlexJobs, Working Nomad, Upwork and Outsourcely. Transcription work isn’t the most creative work, but for writers it’s a way to make money on the side, because it’s a skill that most writers (especially journalists) already have — fast and accurate typing skills and prior transcription experience. 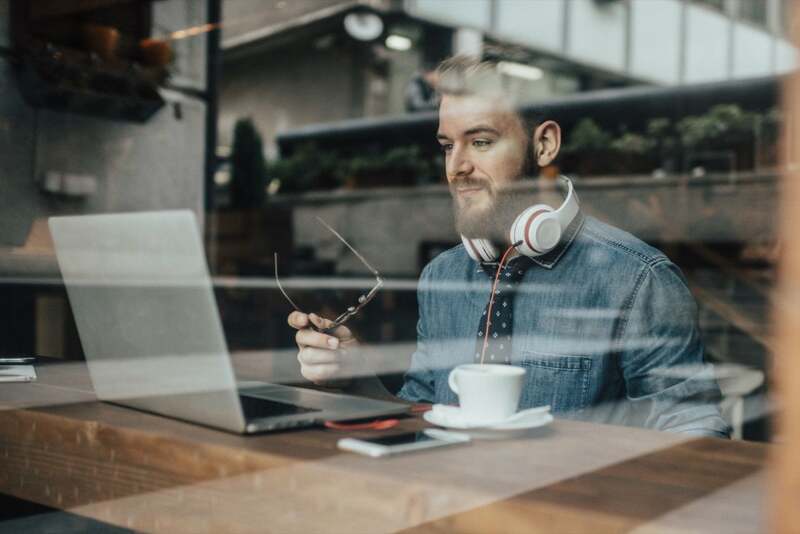 Transcription can be done from anywhere with the right equipment: laptop, Wi-Fi and headphones. Many of us already start at the baseline of having a computer, word processing software, headphones and internet access, so if you possess these things, there is little getting in your way to work as a transcriptionist. In addition to being a fast and accurate typist, you also need to have basic computer skills, including being able to download media files (so if you don’t have a media or audio player on your computer, you can download what’s needed), attach files to emails and send them and convert word processing files into whatever file format the client needs. The job can be done from home and has a lot of autonomy. The required speed varies depending on the company, but the faster the better. The average annual salary for a transcriptionist is $26,882. You generally get paid by how long the audio file is, not how long it takes you to type. When looking for transcription work, emphasize any transcription or word processing experience you’ve had and underscore your knowledge of computer skills. To get started on your job hunt, do a search of “transcription” or “transcriber” on job sites such as FlexJobs, Glassdoor, Monster, ZipRecruiter, CareerBuilder and Indeed. Or you can register as a freelance transcriber on job marketplace sites such as TranscribeMe, Go Transcript, UpWork and PeoplePerHour. Teaching and tutoring are work that both liberal arts and STEM candidates can pursue, however the work in both cases carry a lot of room for creativity. Even if the ends are for a student to learn certain skills, the means to get there allows for a lot of individual expression. Naturally, virtual tutoring and teaching are popular ways to make money on the side and work from home, using the ease of FaceTime, Skype, Google Hangouts and other technologies to communicate with students. The majority of tutoring companies require a bachelor’s degree and some sort of demonstration of expertise in a subject through experience or some type of assessment. Many tutoring companies offer convenient online training modules. The median hourly wage for a tutor is $17.72 an hour. Do a quick online search of tutoring wages in your area to manage your expectations and set your price. You can create a profile for virtual tutoring companies, which will allow you, in most cases, to be contacted by clients, or you can “bid” on clients looking for tutors. Check out the tutoring companies and marketplaces, including Verbling,Wyzant, Tutor, Revolution Prep and Course Hero, to get started. For highly creative and visual individuals, graphic design can be a great way to make money on the side. Graphic designers work with businesses and individuals creating logos, websites, banners and advertising and marketing materials, to name some. The work is comprised of both understanding the principles of design, as well as knowing how to use the software (such as Adobe Photoshop, Illustrator and InDesign) to execute the vision. Then, there’s the client component: You have to communicate with the client and be able to grasp what the client wants. Graphic designers frequently work with advertising agencies, publishing companies, magazines, corporations, product manufacturers and individuals. As a graphic designer, you don’t necessarily need a degree or certificate, unless you’re trying to work at a creative agency, where the company might require it. However, if you go freelance or work for a smaller company, your work is your calling card. You need a solid portfolio more than a fancy degree. You can build your portfolio by doing small freelance jobs. The average graphic designer makes $48,256 annually, and you can get a feel for jobs in your area by looking on the usual job sites: FlexJobs, Glassdoor, Monster, ZipRecruiter, CareerBuilder and Indeed. Also, try some of the freelancer job sites for creatives, such as Upwork, Fiverr and Freelancer. To learn more about starting a graphic design business from home, read Start Your Own Graphic Design Business by Entrepreneur Press and George Sheldon. It’s available on Amazon, eBooks.com and Barnes & Noble. The world of interior e-design is a relatively new one, and companies including Modsy, Havenly, Decorist and Laurel & Wolf are part of the growing trend of interior design services that offer price-packaged services and employ a stable of freelance designers who are matched with clients. Tara Smith is an interior design freelancer with Modsy, and the Pacific Northwest native says she started her interior design career at a yacht company in 2007 and worked her way up to the lead designer for residential homes at a residential design company. She went back to school in 2014 to earn her B.A. in interior design from the Art Institute of Seattle, and it was during that time her interest in the tech side of design was piqued. Her focus on 3D renderings and technical design documents allowed her the flexibility to embark on a career as a freelance designer since September 2016. She not only works from home as a freelancer, but on the road. For those interested in joining the network of freelance interior designers, anyone with a relevant design degree (interior design, art history, graphic design, architecture, etc.) can be a fit for this work. Typically, Modsy stylists commit anywhere from 20 to 40 hours per week to work on 20 to 30 projects. You can also check out freelancer marketplaces with interior design jobs, such as Upwork, Fiverr and Freelancer. You can also register as a designer on Houzz to get matched to locals looking to hire in your area. Maybe you’ve spent years — maybe decades — of your life developing your skills as a musician. So why not make money teaching? You can teach private lessons out of your home, as well as group classes. To become a music teacher, you need to be able to break down reading music and playing an instrument into easy-to-learn steps. Also, like any teacher, you can create an individualized curricula for each student that takes into account their goals and the type of music they want to play. The median yearly salary of a music teacher is $51,925. There are many paths to become a music teacher. If you want to teach in public school, the steps are more specific. You will need a bachelor’s degree in music and then complete a state-approved teacher preparation program. However, if you go into private teaching, you can avoid the licensing requirements. You still have to demonstrate expertise in your musical instrument and be able to really connect with your students to build a client base. You will need a computer and internet access to do a job search and market yourself. To find clients for your music lessons, you can advertise your services where music lovers go: music and instrument stores, music learning academies and schools. Don’t forget to list your lessons on Craigslist, which is free. Also, do a search for “private music instructor” or “private music teacher” jobs on sites such as Glassdoor,Monster, ZipRecruiter, CareerBuilder, FlexJobs and Indeed. Whether you already have experience as a tour guide or not, part-time work as a tour guide may be a great fit for art, food or celebrity buffs — or someone who knows a lot about a city’s architecture or history. A part-time tour guide position will allow you to share your knowledge with others and interact with locals and tourists. If you already have an area of interest or expertise, that’s a good place to start. You can apply to various places for tour guide work, such as local museums and historical monuments. You can also research private tour companies in your city. It’s work that combines a social aspect — you need to be a bit of a performer — and intellectual and physical aspects as well. You’re teaching people and have to trek around for the job. Actors — or anyone who knows how to learn lines and is comfortable with attention — can be a good fit for the job. You basically memorize a script — its length depends on the length of the tour. As for pay, in Engelman’s case, she initially got paid $15 an hour, plus tips, in New York City. However, she began to freelance for several tour companies, earning up to $200 (plus tips) for a four-hour tour. The national median rate for a tour guide is $11.91 an hour, not including tips. Get started on looking for tour guide work on job sites including ZipRecruiter, Indeed, SimplyHired, Monster and Craigslist. Video editing is an intensely creative endeavor that also requires knowledge of editing software. It’s a good job for highly creative introverts who don’t mind spending hours in front of a computer monitor with headphones on by themselves. Video editors are needed for a variety of industries, including advertising, marketing and media. Video editors need to be fluent in standard editing software, such as Apple Final Cut Pro and Adobe Premiere Pro — and it doesn’t hurt to know Adobe After Effects, a post-production tool. Check out classes and tutorials on Lynda, Udemy, Skillshare and CourseHorse, or you can earn certification from a film editing program, such as the New York Film Academy. However, this field tends to value experience and body of work over anything else. The bottom line is your work. Freelance video editing is a good place to start to build your body of work. Try looking on freelance job sites that specialize in creative freelance work such as Upwork, Fiverr, Freelancer, Guru, PeoplePerHour and FlexJobs. The median annual salary for a video editor in the U.S. is $46,274. Sell crafts online (and in stores). Are you crafty? You may be able sell your unique designs on an online crafts marketplace, such as the ones everyone knows — Etsy and eBay — and on some of the lesser known crafts sites, such as Amazon Handmade, Bonanza, Craft Is Art, DaWanda, ArtFire, Aftcra and Zibbet, to name some. The majority of these sites charge a small fee to list items and then take a percentage (for Etsy, it’s 3.5 percent) of your sales. If you do decide to go this route, don’t list solely on Etsy (or any one marketplace) to sell your items. Etsy is an extremely competitive marketplace, so the price points start low. You’d have to sell a lot of units to make it worth your while. List your crafts for sale on four or five online crafts marketplaces, including Etsy, which offers high exposure, and decide from there whether you need to list your items on additional sites. Another way to go about selling is to set up your own ecommerce site, however you’ll have to pay a monthly subscription fee and figure out how to set up your store, which can be a hurdle for those who aren’t tech-savvy. You can use digital storefronts such as eCrater and Big Cartel. The advantages for online sales for moms are that once you list your items and have inventory, the sales process is pretty passive until you make a sale and have to package and ship. (Some marketplaces do that for you.) However, if you offer custom-made designs, then you have to consider the labor it takes to make your custom crafts, as well as the money required for the materials. The money earned from this endeavor really varies, so be conservative spending on materials in the initial stages. You want to test whether there is an actual market for your crafts, and don’t leave it to just online stores. See if local gift and craft boutiques would be interested in selling your items.